the afternoon went down to Adas as Will was going to Hill Siding. After we came home, worked and weighed butter and dressed two chickens for the church tomorrow. Tuesday February 20th 1900 It was 55 years since Father and Mother were married We took Uncle George and Aunt Lib up with us. I helped Fanny some with the dinner which was very nice. Uncle Jim and the sisters gave Father and Mother a very nice rocking chair. Lee was not so well last night was the only thought to near mar the pleasure of the day. We saw Mrs Horne on the way home and she will lend us the money to make the 1st payment on the farm. Wednesday February 21st 1900 It was a snowy ugly day. I baked cake and dressed chicken to take up to Nelsons tomorrow it is Uncle George birth-day and we are going to surprise him with a dinner. 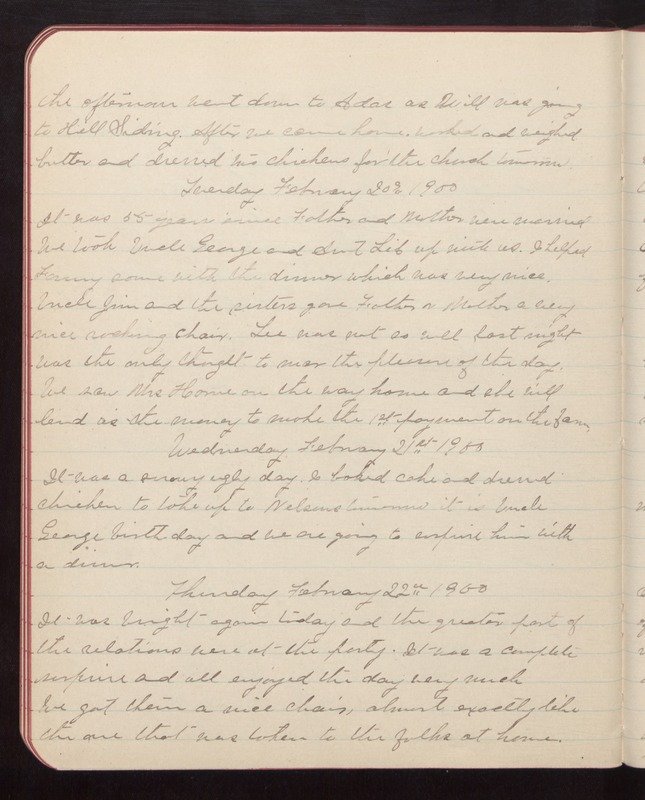 Thursday February 22nd 1900 It was bright again today and the greater part of the relations were at the party. It was a complete surprise and all enjoyed the day very much We got them a nice chair, almost exactly like the one that was taken to the folks at home.